A couple of months ago I was sent The Bane Chronicles by Cassandra Clare to review. The Bane Chronicles is a companion to The Mortal Instruments and The Infernal Devices series and I had not read ANY of them. 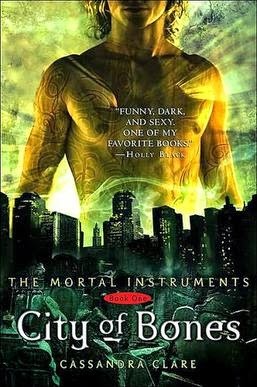 In order to do a proper review I felt like I had to go and read at least one if not both of the series, so I started with the first book in The Mortal Instruments, City of Bones. Fifteen-year-old Clary Fray goes to a nightclub with her best guy friend Simon expecting a night of dancing, but stumbles on a murder in progress. Three strange teenagers covered in tattoos have taken a boy into a back room of the club and are torturing him with the intent to kill. Clary is shocked but even more so when the boy's dead body vanishes into thin air. Thus is her introduction to the world of Shadowhunters, Demons, and Downworlders. Demons exist to plague mankind and take over our world and Shadowhunters (part Angel) live to defeat them. Downworlders are half-demon but they've come to a tenuous truce with the Shadowhunters. As a mundane (normal human) Clary shouldn't be able to see any of them, but she soon learns no one is what they seem. When Clary's mom is kidnapped and Clary has to fight a demon, she seeks refuge with the Shadowhunters from the nightclub, including gorgeous, sarcastic, but brooding Jace Wayland. Clary learns about this weird world of demons and angels from Jace and his foster siblings Alec and Isabelle. They all must work together to try to save Clary's mom and battle the Big Bad--rogue Shadowhunter Valentine who led a failed revolt years ago in an attempt to destroy all Downworlders. Fans of Buffy (as I am) will love this series. This first book was also made into a movie which should appeal to teens as well.